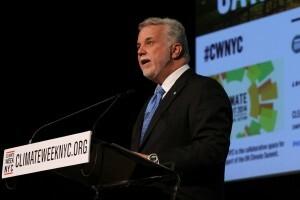 Philippe Couillard speaking at the opening day of NYC Climate Week in New York, on September 22, 2014.” The photo was taken by Tina Fineberg of the Climate Group and licensed under Creative Commons. 2014 was a year of change in Quebec, as Philippe Couillard led the provincial Liberals to victory over the Parti Quebecois (PQ) government of Pauline Marois. Since taking power Couillard and his Intergovernmental Affairs Minister, Jean-Marc Fournier, have played up Quebec’s “distinct society.” In a speech at the Canada 2020 conference, Fournier claimed that the “distinct society” clause that had scuttled the Meech Lake Accord was a “fait accompli” even as Quebec contributed to Canada’s efforts to deal with issues like climate change. When questioned about this, Couillard was careful to say that he would only pursue constitutional negotiations if Quebec was approached on the issue and that his primary focus as Premier would be on the economy. Though, in their comments and speeches, Couillard and Fournier have repeatedly spoken about the need to recognize Quebec’s distinctiveness in Confederation, they’ve also talked about the benefits to Quebec of being part of Canada, and the positive role Quebec can play in the country. In these sentiments, Quebec’s Liberal Party evokes ideas that took their root in the debates over Canada’s Confederation. Couillard’s and Fournier’s words and actions are quite similar to those of George-Étienne Cartier, Quebec’s leading Father of Confederation. Cartier’s own words and actions during the original Confederation debates in 1864 had a powerful influence not only on how the British North America Act as a whole was shaped, but also how it recognized subtle but important differences between Quebec and the other Canadian provinces. 2014 is the 200th anniversary of Cartier’s birth, and the 150th anniversary of the Confederation debates in Quebec City. This makes it an ideal time to study Cartier’s influence on Confederation, and on modern Quebec federalism. In the debates to join the United Province of Canada with Newfoundland and the Maritimes, some of the Upper Canadian delegates, like George Brown, insisted that the new country’s legislature should have “representation by population”, which would distribute seats to different parts of the new country according to how many people lived there. Other Anglophone delegates, like John A. Macdonald, also wanted Canada to be a plain “legislative union” that simply joined all the British North American colonies together, erasing their borders. This was unacceptable to Cartier and the other Francophone delegates from Lower Canada. Many Lower Canadians were concerned about losing the provincial autonomy necessary for their cultural survival to an Anglophone majority. Cartier himself was quoted in the La Minerve newspaper, one of his strongest sources of support, as stating that Francophones felt that guaranteeing their nationality’s autonomy was the most important element of Confederation. Cartier played a leading role in breaking the impasse between the Francophones who sought to ensure their province’s local autonomy and the Anglophones who wanted a strong central government by proposing that Confederation be a federal system. He used federalism to provide an important middle ground between the desires of Francophone and Anglophone Canadians that would provide the benefits of unity while also respecting Francophones’ local identities rather than assimilating them. Cartier built support for Confederation in Lower Canada based on this framework. He and his supporters pointed out that Francophone Quebecers needed to remain a “distinct and separate nationality”, and that the issues dealt with in Ottawa would provide “no more danger to the rights and privileges of the French Canadians” than to any other nationality. Likewise, La Minerve insisted that Lower Canada must continue to govern its own social and cultural life under Confederation. According to P.B. Waite, Lower Canadian support for Confederation depended on Cartier and his ability to demonstrate that union would not involve the concession to the federal government of the powers necessary for Francophones’ cultural survival. Macdonald knew that Cartier and his supporters would only agree to Confederation if it were federal in nature. As such, the British North America Act was to recognize Quebec’s distinct nature in several ways, most notably in Sections 22, 93, 94, 98 and 133. Section 94, for example, excludes Quebec from the federal government’s authority to transfer responsibility for property and civil rights from the provinces to the federal government. According to Samuel LaSelva, Section 94 is a recognition of Quebec’s distinctiveness in Canada, enabling the other provinces to transfer power over property and civil rights to the federal government while enabling Quebec to maintain legal control. Constitutional expert Peter Russell similarly notes that Sections 22 and 98 of the BNA Act also involve special legal provisions for appointing Quebec judges and senators. Likewise, section 93 provides for the recognition of Protestant schools in Ontario and Catholic schools outside it, while Section 133 provides for the recognition of both English and French in the Quebec legislature. Historians Claude Couture and Jean-François Cardin cite these articles as proof of the “compact theory” and the “two-nations” theory, which posited that Canada was created by an agreement between the Anglophone and Francophone nations that founded it. Paul Romney notes that this view became widespread among the Franco-Quebec elite, who considered Confederation as the latest in a series of agreements between themselves and the Anglophones ever since the Conquest. Notably, Cartier and Macdonald also presented the BNA Act as a “treaty” and promised that it would be presented to the British as such. P.B. Waite notes that, in addressing Cartier’s concerns in the BNA Act, Macdonald made Confederation an “elastic blueprint” that would be further developed by practical experience. Many Anglophones wanted a plain union, but Francophones like Cartier, and other supporters in the Maritimes, had powerful attachments to their local identities and provinces. Confederation was thus an attempt to find a middle way between these desires. The compact theory of Confederation owes much to Cartier’s legwork and advocacy, but this was only one part of his views on Canadian federalism. The other part involves his desire to create a new “political nationality”, one in which Francophone Quebecers would continue to maintain their local identities, while at the same time participate in a larger common cause with other Canadians. First discussed in 1865, this political nationality did not replace local and provincial identities like the Francophone Quebec one, but rather it built on them. In a speech given in Montreal on October 20, 1866, Cartier glowingly described Confederation as a “glorious era” of which Francophones did not need to be afraid. He added that they had no reason to fear their Anglophone neighbours. Rather , they could benefit from combining the best qualities of Anglophone Canadians with their own strengths. In doing so, they would bring together all of the lands discovered by French explorer Jacques Cartier, and extend their influence beyond Lower Canada. For Cartier, although Canadians had many unique local identities, the people of the British North American colonies had similar interests and sympathies, including a desire to live under the British Crown. Having a diversity of cultures was a benefit, not a problem, because they could all come together through the political nationality and contribute to their common good. The common interests of the political nationality would be addressed by the federal government, while the interests of peoples’ local and provincial identities would be addressed by the local, provincial governments. The rights of linguistic minorities, whether the rights of the Anglophone minority in Quebec or the Francophone minorities elsewhere in Canada, could also be guaranteed by constitutional remedies, and a sense of fair treatment throughout Canada. George-Étienne Cartier, with his concerns for the distinct status of Francophones and Quebec in Confederation, his insistence that Confederation be a federal union and his support of a “political nationality” that complemented but did not assimilate other identities, played an essential role in finding that middle way. By incorporating his concerns and ideas into Confederation and synthesizing them with the goals of other Fathers like Macdonald and Brown, Canada was made all the stronger. Philippe Couillard and Jean-Marc Fournier have shown similar tendencies, as have other Quebec federalists, such as former Liberal leader Stéphane Dion and former provincial Intergovernmental Affairs Minister Benoit Pelletier.. Their commitments and comments are strikingly similar to those demonstrated by Georges-Étienne Cartier during and after the Confederation debates. Addressing Cartier’s concerns and incorporating them into the British North America Act proved to be a tremendous success not just for Quebec, but for Canada as a whole. Cartier demonstrated that there was no conflict between a commitment to Quebec’s distinctiveness in Canada and a concern for the country as a whole. Many modern Quebec federalists, such as Couillard, Fournier, Dion and Pelletier, continue to follow the same spirit as Cartier by expressing their pride in the larger Canadian nationality, while also insisting that Quebec is a distinct and unique part of Confederation. The Quebec Liberals have made clear that, while there is nothing necessarily wrong with federalism in its current form, a formal constitutional recognition of Quebec’s distinct status would make federalism all the stronger. Incorporating their concerns into Confederation, as Macdonald did with Cartier, would not only strengthen the Canadian federation, but it would also be a fitting tribute to the legacy Cartier and his colleagues have bequeathed us. Jared Milne has an MA in Canadian Studies from Campus Saint-Jean at the University of Alberta. A.I. Silver, The French Canadian Idea of Confederation, 1864-1900, (Toronto, Ontario: University of Toronto Press, 1997), 34-36; La Minerve, September 14, 1864. Samuel LaSelva, The Moral Foundations of Canadian Federalism: Paradoxes, Achievements and Tragedies of Nationhood, (Montreal & Kingston: McGill-Queen’s University Press, 1996), 48, 159. La Minerve, July 16 and August 30, 1864, July 17 1866, July 1-2, 1867; Cartier quoted in Parliamentary Debates on the Subject of the Confederation of the British North American Provinces (Ottawa, 1865), 368; P.B. Waite, The Life And Times Of Confederation, 1865-1867: Politics, Newspapers and the Union of British North America, (Toronto, Ontario: Robin Bass Studio, 2001), 152-155; and Silver, 40-42, 50. Peter Russell, Constitutional Odyssey: Can Canadians Become A Sovereign People? 3rd Ed. (Toronto, Ontario: University of Toronto Press, 2004), 26, 306. Jean-François Cardin and Claude Couture, in conjunction with Gratien Allaire. Histoire du Canada: Espaces et differences, (Saint-Nicolas, Quebec : Les presses de l’Université Laval, 1996), 64. Paul Romney, Getting It Wrong: How Canadians Forgot Their Past And Imperilled Confederation, (Toronto: University of Toronto Press, 1999), 148. Quoted in Desmond Morton and Morton Weinfeld, eds., Who Speaks For Canada? Words That Shape A Country, (Toronto, Ontario: McClelland and Stewart, 1998), 36-38. The preceding two paragraphs are summarized from LaSelva, 37-42. Stéphane Dion, Straight Talk: Speeches And Writings On Canadian Unity, (Montreal and Kingston: McGill-Queen’s University Press, 1999), 138-150.